"If you knew someone was going to die, would you try and save them?" 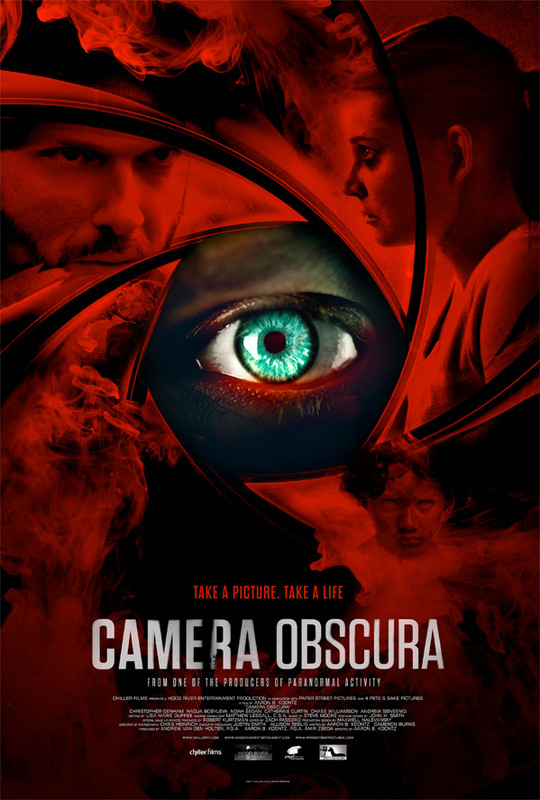 Chiller Films has debuted the official trailer for a horror film titled Camera Obscura, arriving in theaters this June. The film is about a veteran war photographer who returns from Afghanistan with PTSD. His girlfriend gives him an old camera, which he starts shooting with, only to discover (when he develops the film) that it takes photos of imminent deaths. It's kind of like Final Destination, but with a camera. Christopher Denham stars, with Nadja Bobyleva, Catherine Curtin, Chase Williamson, and Noah Segan. The title, Camera Obscura, is a reference to pinhole photography, a real technique that doesn't seem to be used in this. But it's only a title. A veteran war photographer (Christopher Denham) with PTSD sees imminent deaths in his developed photos, questioning his already fragile sanity and putting the lives of those he loves in danger. Camera Obscura is directed by American filmmaker Aaron B. Koontz, making his feature directorial debut after a few short films previously. The screenplay is co-written by Aaron B. Koontz and Cameron Burns. This first premiered at the Florida Film Festival just this month. Chiller Films will release Koontz's Camera Obscura in select theaters starting on June 9th, plus it's available on VOD the week after. Anyone interested in this?